Ashoka Halwa or Moongdhal Halwa is one of my favorite sweet. Protein rich Moong dhal is the main ingredient for this dish. 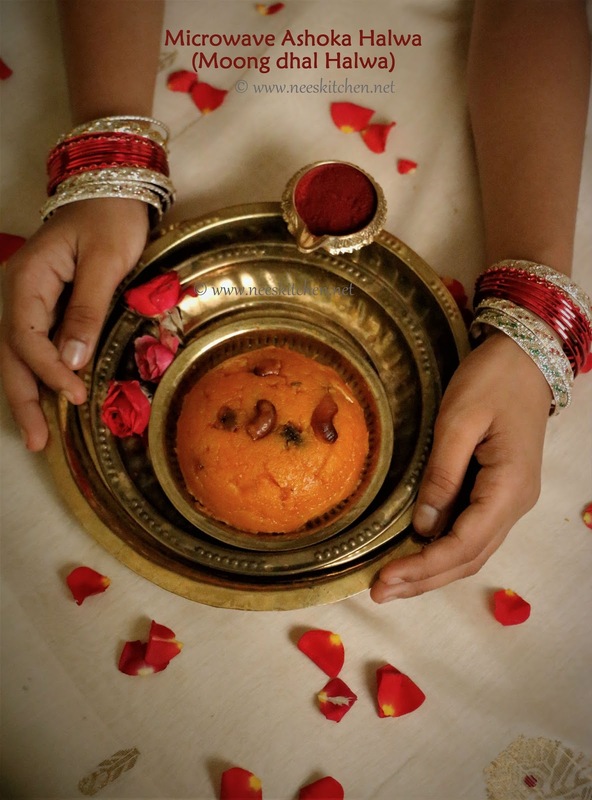 Ghee gives the richness to this halwa while cardamom powder makes this sweet and exotic dish. Cooked moong dhal merges well with these ingredients and transforms into a mouthwatering sweet. 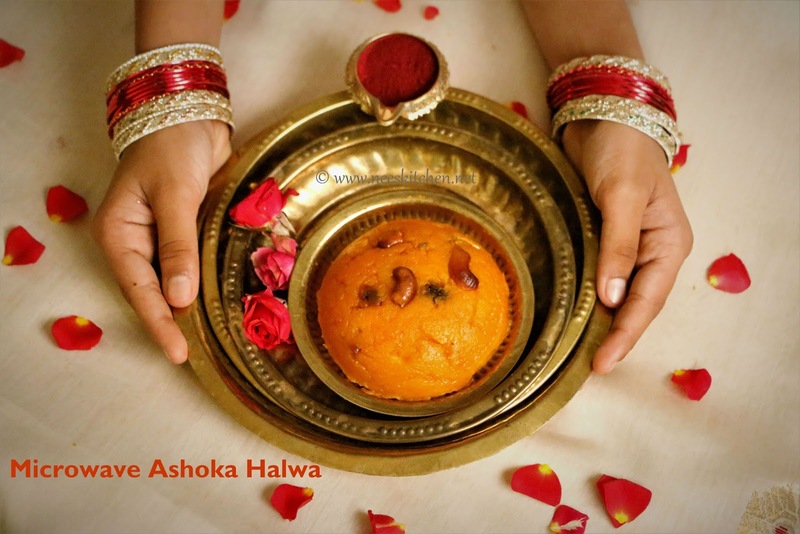 Ashoka Halwa or Moongdhal Halwa requires a lot of time and effort when cooked on stove top. The microwave version of this recipe makes it easy and less complicated. Make sure to use a microwave safe glass container or ceramic container. You may adjust the sweetness and increase the quantity of ghee if required. 2. Pressure cook moong dhal for 3 whistles (or till soft) and once the pressure is released take and mash very nicely. Set aside. 3. 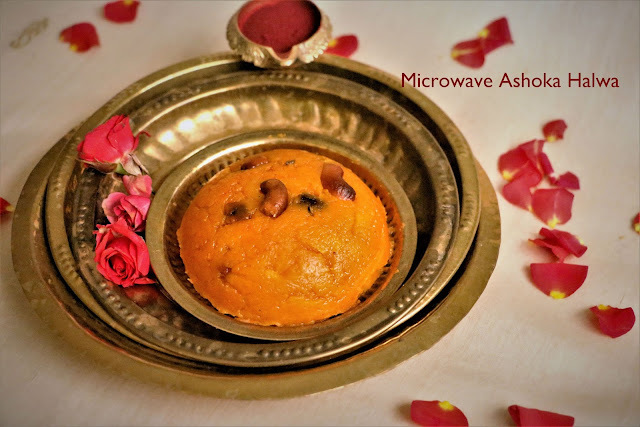 Take a small microwave safe bowl (Only glass or ceramic material). Add 3 tsp of ghee & cashew nuts. Mix well and microwave for 1 minute 40 seconds. 4. Transfer the fried cashew nuts into another bowl and retain the ghee. 5. The ghee will be still hot and mix the wheat flour in that. Set aside. 6. Take a big microwave safe bowl (Only glass or ceramic material). Optionally coat with a spoon of ghee. 7. Add dhal and sugar to the bowl and mix well. 8. Microwave high for 4 minutes, stirring in between every 2 minutes. At the end of 4th minute sugar would dissolve completely. 9. At this stage, add 1 tsp of ghee and microwave for 2 minutes. Repeat this process of adding 1tsp ghee every 2 minutes until the ghee starts to separate. This could take a total of 4 minutes for the quantity and container shown in the Video. 10. Add food coloring, cardamom powder, fried cashew nuts, wheat flour and 3 tsp of ghee. Combine and mix them well and add 3 more teaspoon ghee. You may add additionally also at this stage. 11. Microwave high for 1 minute. 1. Use a glass container or ceramic container. Do not use plastic microwave bowl. 2. Amount of ghee and sugar can be adjusted according to your taste.